Concrete is strong in compression but relatively weak in tension. One way to overcome this shortcoming is to impose a field of compressive stress on the member so that even under maximum loading the member is still in compression, or limited tension. This is referred to as Prestressed Concrete as stress is deliberately imposed prior to the member being put into use. There are two common ways of prestressing concrete; by pre-tensioning or by post-tensioning. With pre-tensioning, the tendons are stressed before the concrete is placed. The tendons are stretched between strong bulkheads which withstand the forces and the concrete is poured around them. This system is most frequently adopted in precasting yards. Post-tensioning involves stressing the tendons after the concrete has been placed and cured. The tendons are cast into ducts or sleeves to allow the strand to slide through the hardened concrete and corrosion protection is normally provided by injecting cement grout or grease. 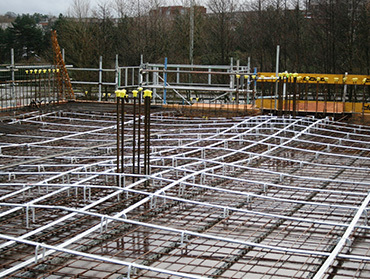 Post-tensioning is used in bridges, floor slabs, silos and many other forms of construction. It can bring significant benefits in terms of economy, construction programme, structural performance and reduction in material usage. To find out more about the PTA please click the button below. The 2015 charter of stressing the importance has been designed and implemented by our members to support the PTA in achieving its core objectives of promoting best practice in all aspects of post tensioning. The PTA believe that by continually developing post tensioning to meet the increasing demands of the modern construction environment it will enable post tensioning to take full advantage of all its opportunities and realise its full value potential for all stakeholders. PTA is committed to continually developing safety standards on site and to work towards the industry wide target of zero harm. PTA members are actively involved in the development and implementation of initiatives designed to directly target improvements in reporting and resolving all safety concerns on site and in offices. Post tensioning requires skilled, component and experienced labour both on site and in design and PTA recognises the importance of not only cementing current standards but working to improve standards going forward. PTA is committed to ensuring that best practice is standardised throughout all post tensioned contracts not only for today’s projects but also in preparing next the industries next generation of leaders. The design of post tensioned structures is skilled and complex and should only be undertaken by skilled and experienced designers. PTA is working proactively to improve the knowledge and awareness of the design requirements for post tensioned structures, not only to ensure consistency and conformity but also to ensure that the full design benefits of post tensioning are well known! PTA acknowledges that the targets set out in the industry construction industry strategy for 2025 will be challenging. However, we also recognise that is it our responsibility to ensure that post tensioning evolves and grow both through targeted strategies and natural processors to meet these demands. Post tensioning has significant advantages of other techniques in terms of lower cost / less materials, less CO2 emissions and faster installations and is investing significantly in enhancing these benefits even further.